GenesisPlus is a Nd:YAG 1064nm laser which has been proven to be both a safe and effective treatment for fungal nail infection and is also a safe and effective treatment for warts. It is recommended that you have 3 treatments to receive optimum results. We do not treat individual toes. We treat both your feet as the infection can spread easily from one toe to another. If you have had the infection for more than five years, you may need an extra couple of top up treatments. The treatments occur 3 to 4 weeks apart. 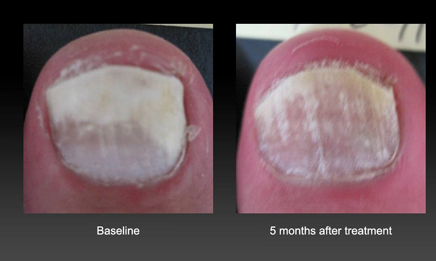 Immediately following the treatment, your nail may feel warm for a few minutes. 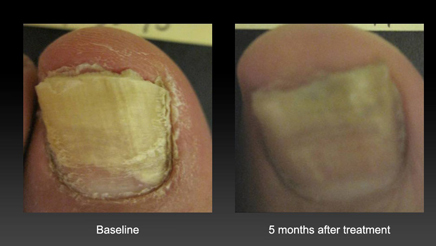 Over the following weeks, you should be able to see a healthy nail growing through clear of any fungus. You will need to be patient as you may not see any healthy nail growth for around three to six months depending on how quick your nails grow. There is a slight chance of re-infection as the fungus is present everywhere in the environment so it is best to continue with the after care as laid out in the after care sheet given to you once you start the treatment for 3 months after the last treatment. You must remove nail varnish and any nail decorations the day before treatment and also cut your nails down. You can reapply nail varnish immediately after treatment but do not use any old nail varnish that you have in your possession. For any other concerns or queries you may have about this treatment, please visit our contact page to get in touch with us. The GenesisPlus is rapidly becoming the laser treatment chosen by both doctors and patients looking to treat fungal nail infection effectively. For pricing enquiries you may have about this treatment, please visit our contact page to get in touch with us or call us at 01233 661662.